Dog Trainers - TAILS Foundation Inc & PETwork Society! Businesses listed below are general community businesses and are not members or sponsors of TAILS Foundation Inc, and have not been approved through our evaluation process. 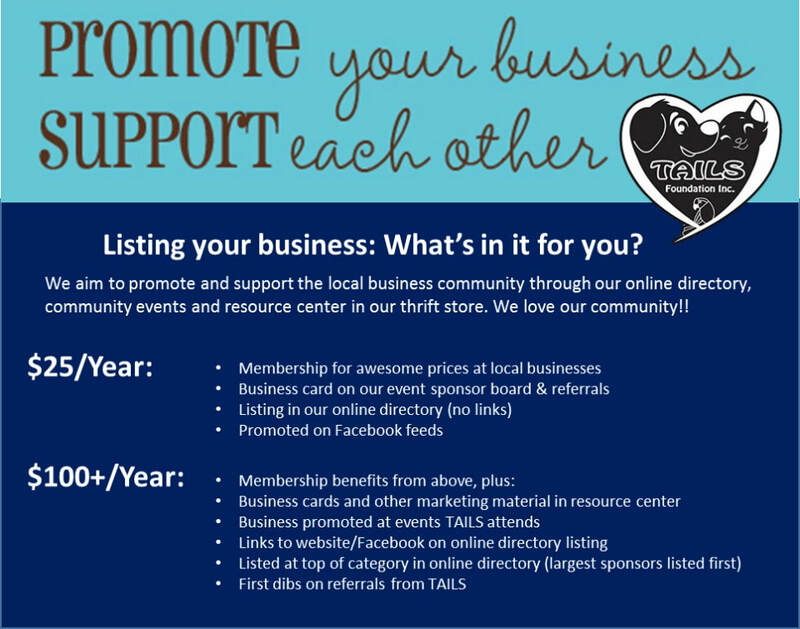 If YOUR business is listed below and would like to become a member or sponsor, please contact us immediately!! Too many dogs are given up after their normal, easily modifiable behaviors are allowed to become problems. But it doesn't have to be this way. To prevent your dog from becoming a sad statistic, take your dog—and your family—to a professional dog training class. A good training class is a fun, social activity that helps your dog become a well-behaved, safe, and valued family member. This information will help you find the dog trainer and class environment that best fits your budget and needs. Whether you are intentionally teaching him or not, your canine friend is always learning—and this is true not just for puppies but also for older, adult dogs. If you do not teach your pet your rules, he will invent his own. Training allows caregivers to safely and humanely control their dog's behavior. Positive training enhances the bond between dog and owner, and helps ensure that your dog will respond happily to your instructions. It's essential that the dog trainer you select uses humane training techniques that encourage appropriate behavior through such positive reinforcement as food, attention, play, or praise. Look for a trainer who ignores undesirable responses or withholds rewards until the dog behaves appropriately. Training techniques should never involve yelling, choking, shaking the scruff, tugging on the leash, alpha rolling (forcing the dog onto his back), or other actions that frighten or inflict pain. A recommendation from a friend, neighbor, veterinarian, humane society, boarding kennel, or groomer is a good place to start. You can also search online or check the Yellow Pages under "Pet Training." Don't assume that a trainer's membership in a dog trainer association qualifies him as a suitable instructor: Not all associations' membership criteria will meet your expectations. Also, because no government agency regulates or licenses trainers, it's that much more important to investigate their qualifications before enrolling in a class. Find out how many years of experience they have, how they were educated, and what training methods they use. Ask prospective trainers for several references from clients who completed the classes. In group classes, dogs learn to interact with other dogs, accept handling by other people, and respond to their owners despite distractions. Owners learn by observing other people interacting with their dogs and benefit from the camaraderie. Self-help training, private lessons, and dog-only lessons that exclude the owner do not provide these important advantages. Another disadvantage of dog-only lessons is that the dog may respond well for the trainer but may not transfer what she has learned to you and your family. When possible, all family members should participate in the dog's training. By learning to communicate humanely and effectively with their canine friend, they will develop bonds that will form the basis of the entire relationship. Is class size limited to allow for individual attention? Are there separate classes for puppies and adult dogs? Are there different class levels (for example, beginner, intermediate, and advanced)? Are training equipment and methods humane? Does the trainer use a variety of methods to meet dogs' individual needs? Is proof of vaccination required? Are the students, both human and canine, enjoying themselves? Are dogs and owners actively encouraged? Are voice commands given in upbeat tones? Is information available on how dogs learn, basic grooming, problem solving, and related topics? Training costs vary, depending on where you live and the type of instruction you want. Private lessons are usually priced per session; many group lessons are priced for several weeks of sessions. Some animal shelters offer subsidized training programs; the price of several weeks of sessions may depend on whether you adopted your dog from that shelter and the number of class sessions it provides. The best age for training Although "puppyhood" is the best time to train and socialize dogs, older dogs can learn new tricks, too. In fact, dogs of all ages can benefit from training. Dogs between 8 and 16 weeks of age should be enrolled in puppy classes. Regular classes are appropriate for dogs 6 months or older. Have your dog examined by your veterinarian to ensure your pet is healthy, free from parasites, and up-to-date on vaccinations. Don't feed your dog a large meal before class because many trainers rely on food treats to encourage or reward desired behavior. Bring the training equipment recommended by the trainer. Practice between classes with brief lessons that end on a positive note. By enrolling and actively participating in a dog training class, you will help your dog become not just a well-behaved member of your family, but also a safer member of your community.